Angel Rippon, from the BBC, interviews a researcher from the University of Minnesota. One would not expect to find the School Sisters of Notre Dame, a congregation founded to teach girls in Bavaria, to be involved with cutting-edge biomedical research. And yet, the School Sisters of Notre Dame in North America have done just that for more than 20 years. Our ministries have expanded over the years to follow God’s call, and that expansion has included research. In the late 1980s, Dr. David Snowdon began a pilot study on aging with SSNDs in the Mankato, Minnesota, area. In 1990, Dr. Snowdon moved to the University of Kentucky and there expanded his study to include Alzheimer’s disease. 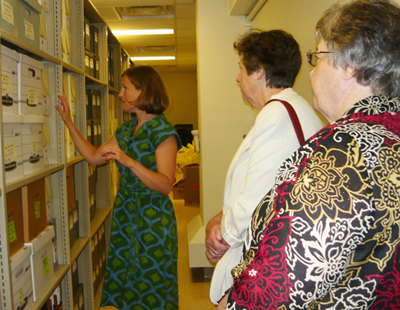 Laura Hemmy, a researcher with the University of Minnesota, (left) talks with Sisters Mary Anne Owens and Kathleen Cornell about the Nun Study. The National Institutes of Health-funded study was expanded in 1991 to all the SSND provinces in the United States. This longitudinal study accepted anyone 75 and older who was interested in participating and has been following them ever since. As of December 2017, there are three sisters still living who are enrolled in the Nun Study. In 1991, 1,027 sisters were eligible, and 678 enrolled – an astounding 66 percent participation rate. Yearly evaluations included various memory tests and physical functioning assessments, a one-time blood test for genetic evaluation of apolipoprotein E (a variation of which increases the risk for developing late-onset Alzheimer’s disease), and brain donation at death. The Nun Study was incredibly unique at its initiation and has altered research ever since. There are multiple evaluations, some have completed 14 rounds. SSND archives have provided extensive data from sisters’ early lives. There also was homogeneity in living conditions, health care, and lifestyle that was difficult to control for in other studies. Angel Rippon, from the BBC, interviews Laura Hemmy from the University of Minnesota. Brain donation was agreed to whether or not the sister had dementia, and for the first time, they had a significant number of older, cognitively-intact brains to evaluate and compare. A 98 percent brain donation rate in the Nun Study is remarkable and difficult for any other study to duplicate. Numerous papers have been written about the research results, but the finding related to Idea Density has been the most unique. Evaluating sisters’ autobiographies written when they were in their early 20s, researchers found that those with the greatest idea density were less likely to develop Alzheimer’s disease later in life. Another discovery showed that fewer Alzheimer’s disease brain lesions were required to cause dementia if a stroke was also present. 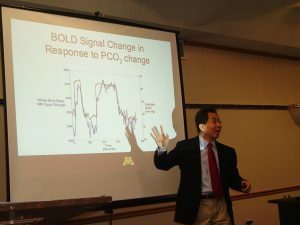 After Dr. Snowdon retired, the study moved back to the University of Minnesota in 2008. Data can be evaluated for years to come. Some researchers are using data to look further into Parkinson’s disease and other movement disorders. Dr. Kelvin Lim, director of the Nun Study at the University of Minnesota, uses a PowerPoint slide to illustrate his presentation on potential benefits of the Nun Study during a presentation to SSND leadership. Dr. Kelvin Lim and Laura Hemmy, PhD., are developing a new study open to all SSNDs, which will provide background data for a biomarker study – to be able to assess risk of developing Alzheimer’s disease while cognitively intact. This is crucial in trying to prevent the cognitive decline as there are no cures at this time. Besides making the Nun Study data an international scientific and teaching resource, the researchers are collaborating with Rush Medical Center in Chicago on the Religious Orders Study, as well as several other ongoing studies. As they collaborate with the researchers and participate in the studies, School Sisters of Notre Dame are demonstrating that they truly are educators in all that they are and do.